1 in 2000 babies might well be born with a tooth already present, but for most parents, you can expect your baby to develop their first tooth around 6-10 months old. Every child is different. Some may get their first tooth around 6 months, others may not develop their first tooth until they are 13 or 14 months old, but come 3 years of age they will usually have their full set of milk teeth. Taking care of your babies teeth should ideally begin before that first tooth appears. More important than you might think, the first set of teeth act as placeholders for adult teeth whilst also enabling your child to chew and speak clearly. To help keep them healthy you need to keep those teeth clean and decay free. In this article I take a look at the best toothbrushes for newborns, babies and toddlers. 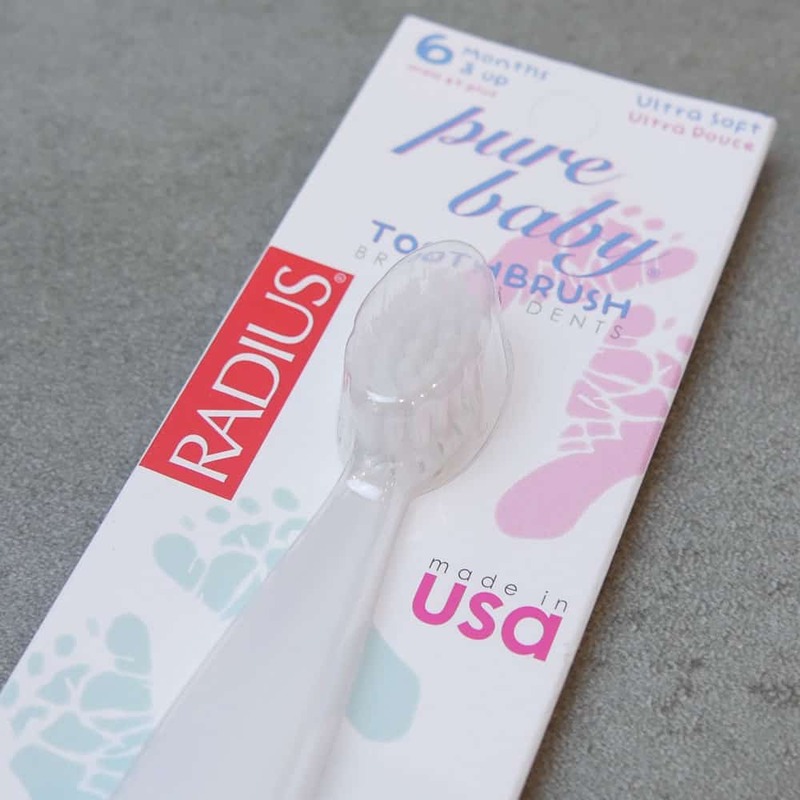 We’ll jump straight into our recommendations below, but if you would like more insight and detail when it comes to choosing baby’s first toothbrush, check out our buyer’s guide a bit further down. Regularly I am asked, what is the ‘best’ for X, Y & Z. To be honest, the answer is often personal but, to help you on your way here are my recommendations. Editor’s note: the official version of this product is hard to source in the UK. We ordered ours from Amazon US. This version on Amazon UK is well-rated, but it is not official and there are some troubling complaints about faults with the product, so do be aware. 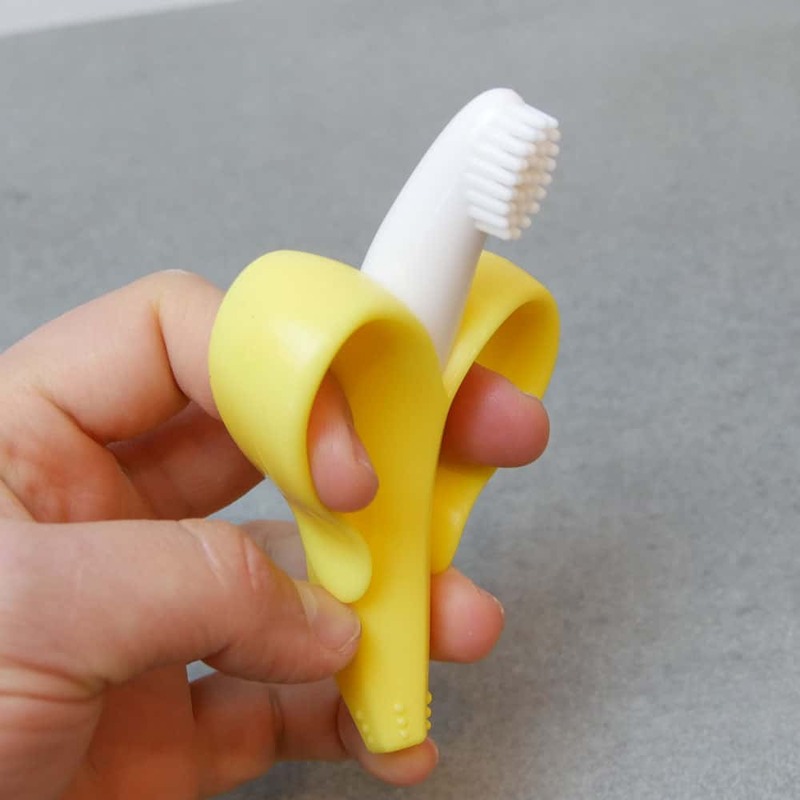 Yes, this toothbrush does look like a miniaturised peeled banana, but despite the unconventional look, something about it really works. Many parents rave about it and I can tell you first hand that my son absolutely loves it. An award winner, the brush is made from 100% food-grade silicone. It is dishwasher safe too, so makes for easy sanitising. 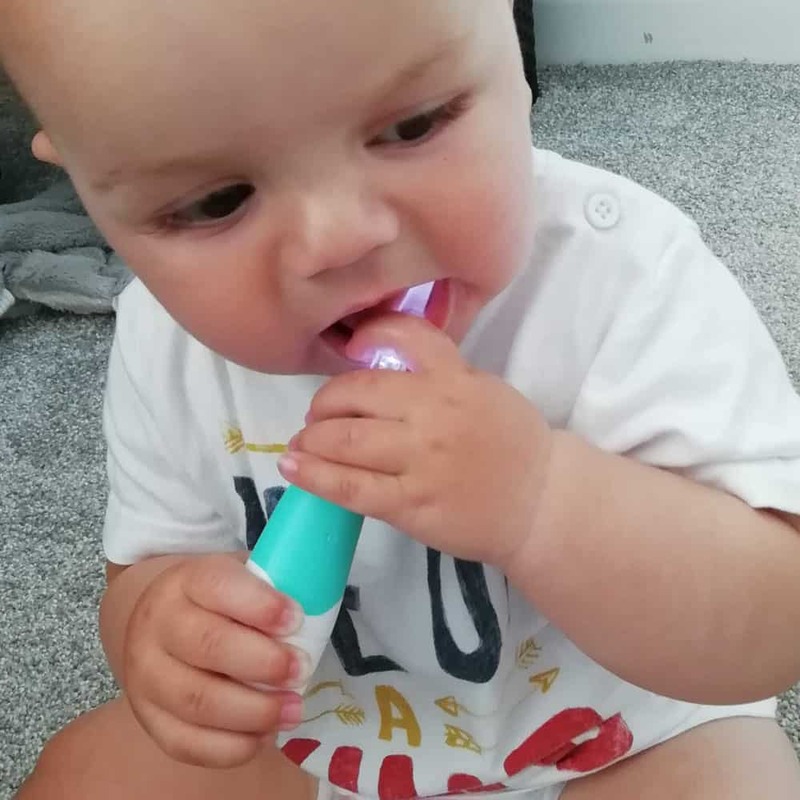 The flexible silicone allows for babies to bite into the brush and ease teething pain, whilst the thick bristles at the tip of the brush make contact with teeth and gums to gently scrape away bacteria. The bold yellow colour captures the attention of the child whilst the peeled skin acts as handles onto which the child can hold. Your child will not injure themselves when biting down on this and there are no bristles to come loose either. The design does allow for it to be attached to a dummy clip (pacifier strap) if desired. Whilst the yellow banana is the classic design, the same quality product is available in other colours such as pink and Blue as well as some slightly different designs, such as corn on the cob. Do be aware there are many copies/fakes of the original which is made in the USA. The original should have the Baby Banana branding on the back of the brush and should be manufactured by Live-Right LLC. You can visit the official Baby Banana website here. Potentially too large for the mouths of some smaller babies. You can read our review of the official Baby Banana here. One of the few electric toothbrushes for babies and toddlers, Brush-Baby have produced an excellent quality brush that helps form good habits from an early age. The brush uses a single AAA battery to deliver 16,000 strokes per minute to the brush head. The motion of the bristles help give that extra bit of cleaning power as you move the brush over and around the child’s teeth and gums. A 30 second pacer and 2 minute timer are built into the brush and it even powers off automatically at the end of the 2 minutes. These are nice features that you normally see on adult brushes, yet here it is for a child. For the youngest of users, you are unlikely to be able to stick to these timings, but as the child grows, it helps develop good habits. It is supposed to be suitable for newborns right through to 3 year old children. 2 different sized brush heads are available, a smaller for 0-18 month old kids and a larger head for 18-36 month olds, 1 of each is provided. Suiting children of different ages it is a nice solution, but not all babies will like the power and sensation it delivers. 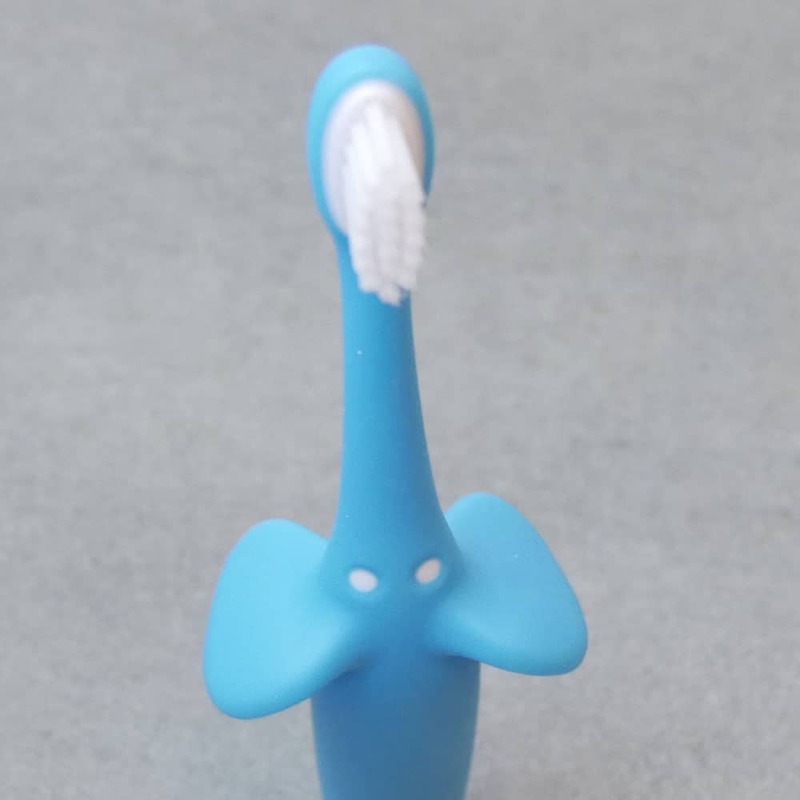 The toothbrush head is more prone to breaking as its not made of soft silicone and has a motor inside, so if your child bites on it too hard or throws it, it might not stand the test of time. A novel feature is a white light that shines up through the clear brush head and helps illuminate inside the child’s mouth, giving you a slightly better view of what’s going on, a feature I really liked. 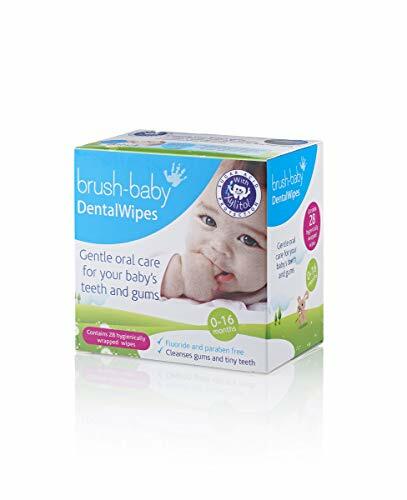 Introduced from an early age, you could see real benefits, but most parents will want to wait until the child is a little older and has perhaps gone through the initial stages of teething and learning to brush before investing in this. Visit the official Brush-Baby website here. Read our full Brush-Baby BabySonic Review here. 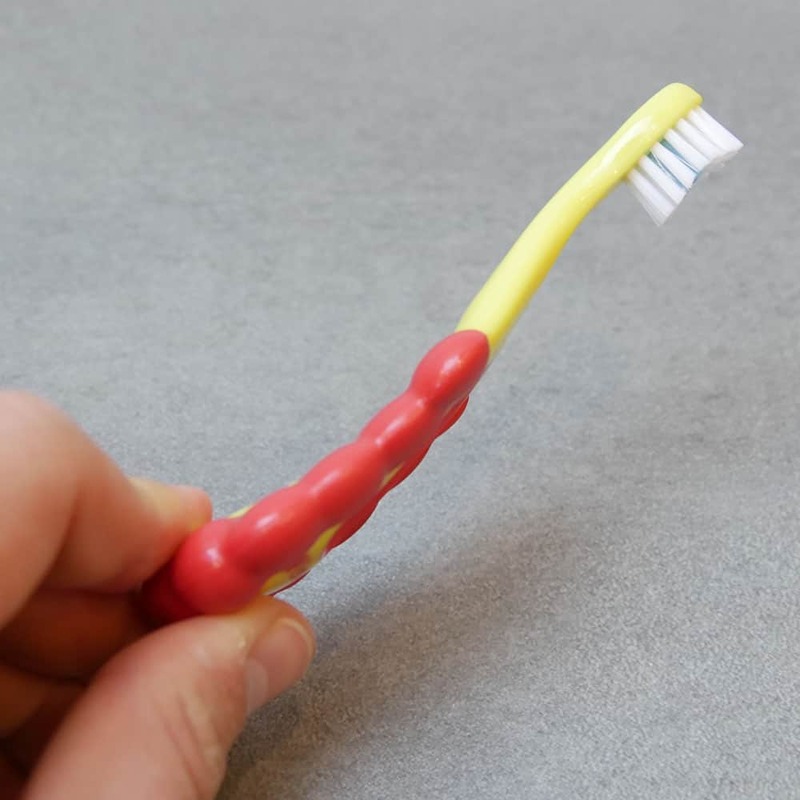 A more conventional toothbrush for your little ones. 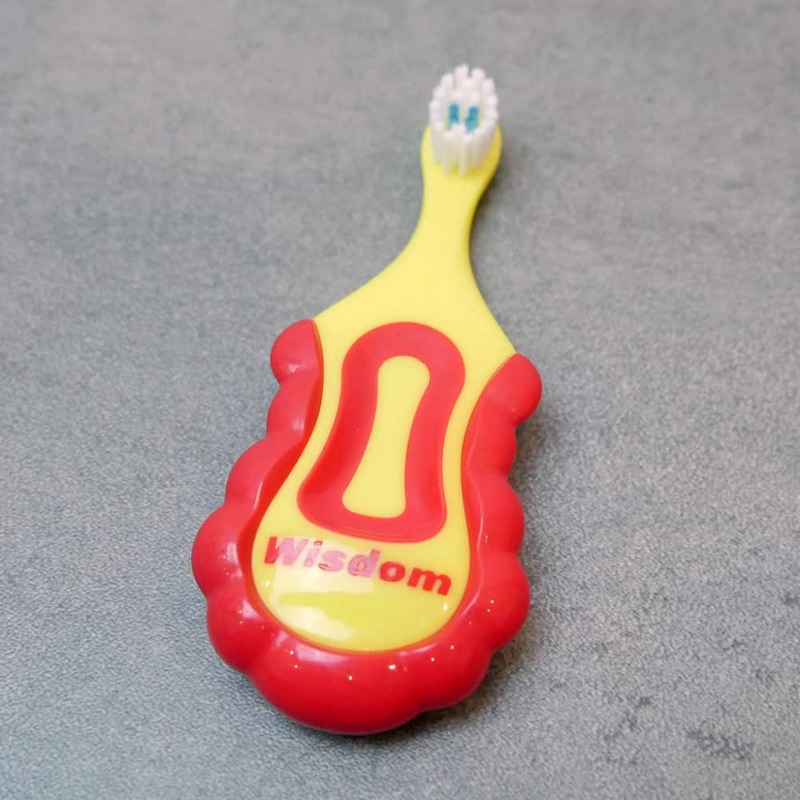 Designed to be used on newborns, babies and toddlers up until the age of 2 years old, the Wisdom step by step brush had a small brush head with very soft bristles. There are even coloured bristles on the head to indicate just how much toothpaste to apply, the reality, is very little – just a smear. Bold in colour, the yellow and red catches the eye of the child. The large handle has a waved edge which offers lots of gripping points. Good for parents and the child alike, the downside is that the handle is made from hard plastic, which is not always so suitable for little hands, who might want something a little softer to squeeze and hold. Unlike some other designs, this is not a brush you can let you child use as a teether, it is too hard and not designed with this in mind. The handle is a bit stumpy too, so as a parent, it can be just a touch trickier to move to the very back teeth. The brush head is small enough that it does not feel too large in the babies mouth, but for those toddlers with nearly all their teeth, you will want to move to a larger head to get a better coverage. Overall a great value and likeable product. Check out the official Wisdom website here. 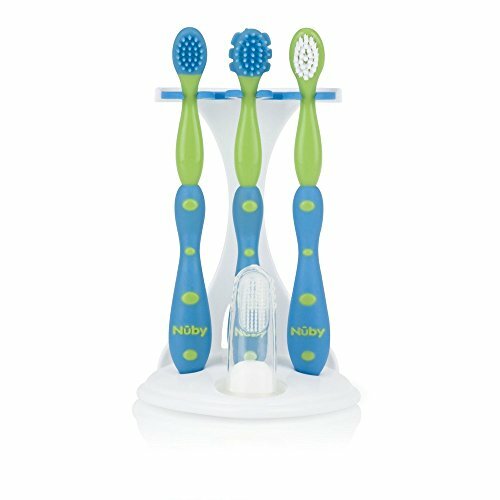 There is a lot to like about the Nuby 4 stage oral care set. For a start, it is very competitively priced given how much you actually get in the pack, as the name implies 4 different types of toothbrush. The concept on offer here is fantastic and is essentially an all in 1 solution for taking your baby on their toothbrushing journey. Each brush helps the child evolve and improve their oral health. 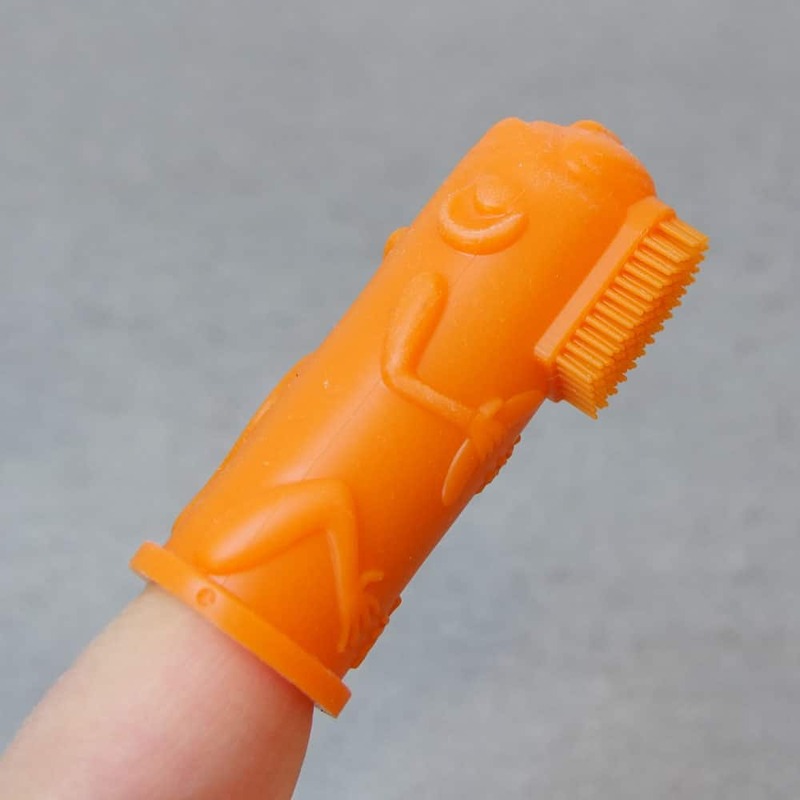 Stage 1 silicone massager – This is a finger toothbrush. Fitting over a parents index finger, the clear tube has silicone bristles on 1 side and a series of little raised bumps on the other. This is suitable for the earliest stages of toothbrushing and helps ease tender gums and help get used to the sensation on the gums and mouth tissue. Stage 2 massaging brush – More like a regular toothbrush, it has a grippy brush handle whilst the brush head is made up of soft tapered bristles on one side and a series of silicone ridges on the other. Stage 3 Massaging Brush – An evolution of the stage 2 brush, the ridges on the back are thicker, there is shaped silicone around the edge and bristles on the front. Together it helps the toddler establish a good all over clean and experience different sensations. Stage 4 nylon bristle brush – A full sized toddler toothbrush, the long brush handle is contoured and easy to hold onto with a good sized brush head for cleaning the teeth. Available in a number of different colours, you can find an option your child likes and need not worry about having to buy replacement brushes as the kit already includes them. Whilst Nuby suggest 0 months and upwards, my own experience suggests introducing at about 4-6 months onwards might be best. Visit the Nuby website here. Made from food grade silicone, ‘The Brushies’ are a series of different finger toothbrushes. Fitting over the parents finger, the silicone will encase the majority of your finger and you can then move the bristles found on 1 side over the teeth, gums, cheeks and tongues of your child. There are different characters which mean a different coloured and marginally different designed fingerbrush. You can buy the fingerbrushes individually, with a story book or all 4 as a set. Neither are ‘cheap’. I like the concept of the brush and book and it will certainly appeal to some children. However, I have concerns that those toddlers aged 12 months or above will not get the best brushing experience from this fingerbrush without a lot of work from the parent. Whilst the silicone will protect your finger, if your child bites, it isn’t going to be pain free. It also does not encourage the child to have a go themselves. Personally I feel these are best for those aged 3-12 months, despite the creators suggesting up to 4 years. Designed by 2 doctors, who themselves are mum’s, the story and ethos behind brushies is heartwarming. The packaging is recyclable, the brushies are BPA free and are able to be placed in the dishwasher. Visit The Brushies website here. A manual toothbrush that works for the parent and child alike. Made in the USA by Radius, the Totz is a brush designed for toddlers aged 18 months and above. The brush head is made up of 4,500 really soft (vegetable based) nylon bristles for gentle, yet effective cleaning of the child’s teeth and gums. The head itself is not tiny, but it is not too large either with an oval shape, to reduce harsh edges and allow you as a parent to move the brush around with ease. The long, wide and flat handle makes for easy grip by the child and the parent and this brush certainly allows to do a bit of their own independent brushing. 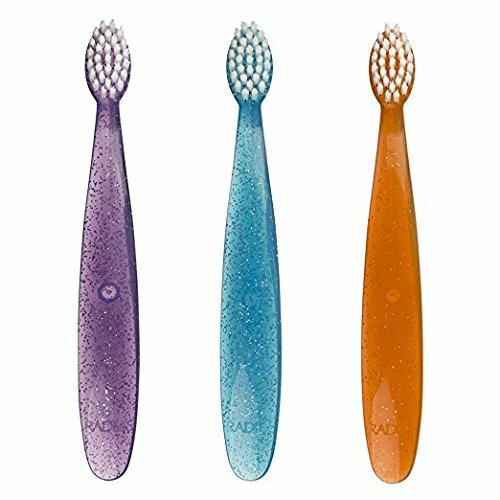 BPA free and approved by the American Food and Drug Administration, the brush itself comes in a number of different colours, complete with a sparkle effect. Chose from Pink, Green, Clear, Blue, Purple and Orange. Visit the official Radius product page here. A manual toothbrush, this is virtually identical to the Radius Totz listed above, but has softer bristles, suitable for younger children. 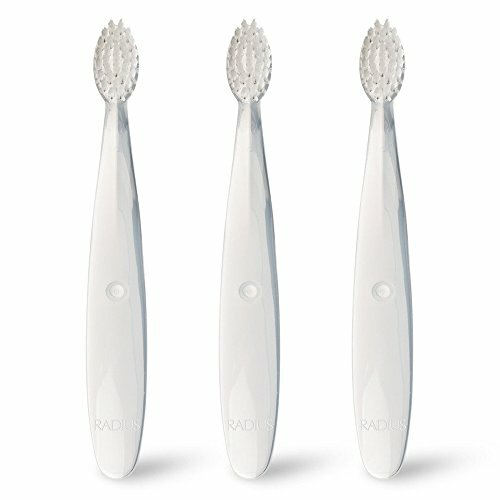 8,000 super soft vegetable based nylon bristles are built into the oval brush head of the Radius Pure toothbrush. Considering they are so soft and have the younger children in mind, the size of the brush head is a little larger than would be expected. It is the same size as the Totz head. OK, in principle, but everyday use for some parents will be more difficult. The long flat handle is easy to grip onto and helps with moving the brush about, but it might still be a bit of a challenge. No harsh edges are present though, so the rounding of the corners avoids causing and injury when brushing. BPA free, the brush comes in just 1 colour and is made in the USA. Visit the Radius Pure product page here. Dr Brown’s is a highly reputable brand, particularly with baby bottles. 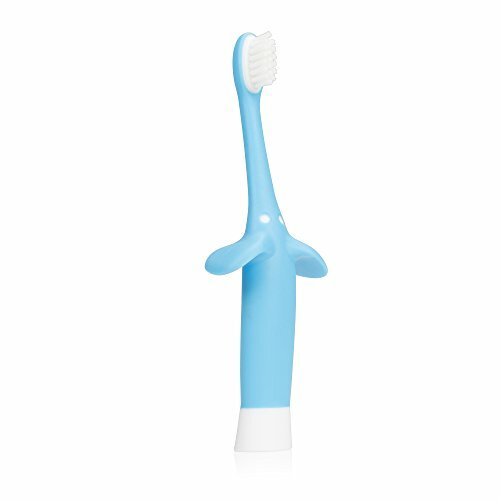 This manual toothbrush has been designed for babies and young toddlers and is somewhat of a transition brush if you like. Whilst suitable form the age of about 6 months right through to 36 months, parents will find those children aged 10-24 months will probably get best use from it. It has a small brush head with super soft bristles and is rounded so as not to cause any harm to the delicate surfaces in the child’s mouth. Designed to look like an elephant, ears act as handles/a natural gripping point for children and it certainly encourages independent brushing, whilst making it a bit more fun too. Those same ears stop the brush from making contact with surfaces, to keep it a little more hygenic when the child is done with it. There is a flex to the handle and neck of the brush which will absorb any excessive pressure whilst the natural curvature of the brush and length of the handle makes for easy reach to back teeth. View the official Dr Brown’s site here. Officially Brush-Baby suggest use with children aged 10-36 months, but I have used this with my son from 6 months old. I honestly believe this has really helped with his teething and the ease with which he has taken to having his teeth brushed. 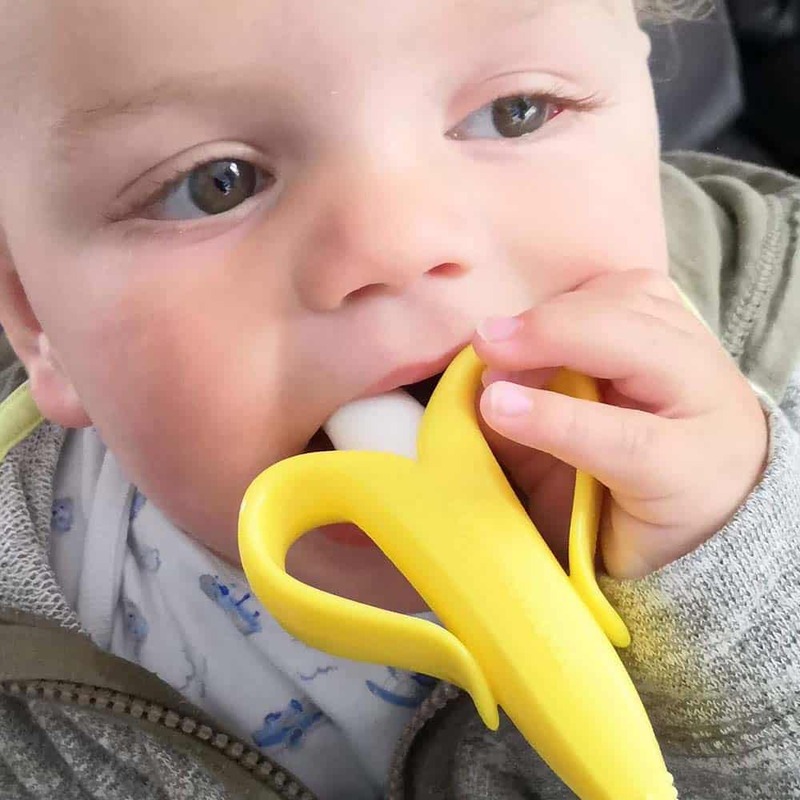 The soft silicone is perfectly safe for your babies and toddlers mouth. 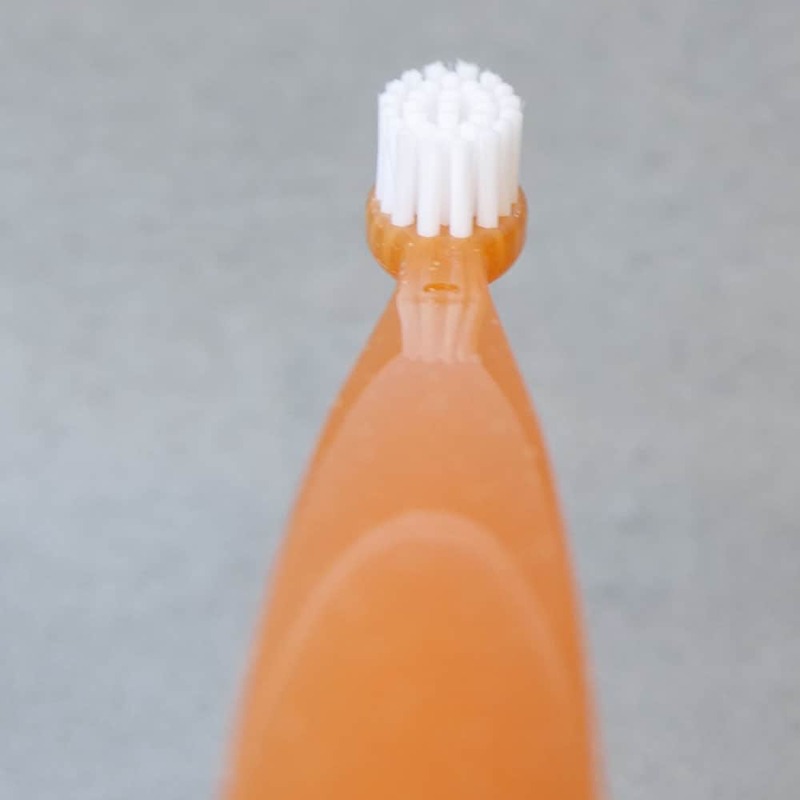 Shaped with a slight curvature, the chewable toothbrush element has 6 bristled sides. 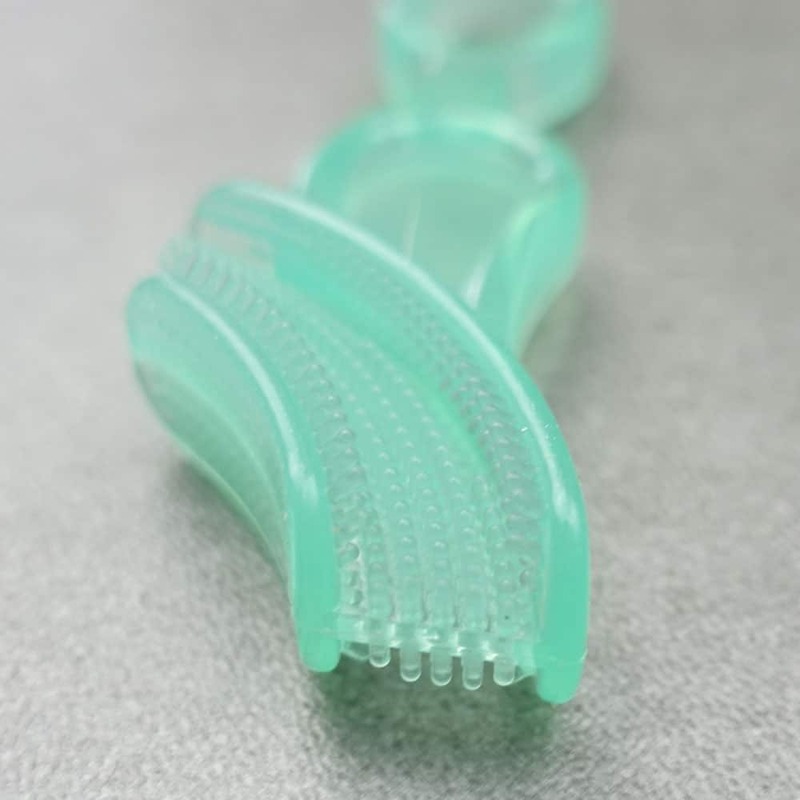 There is a larger flat surface with bristles top and bottom and edges on both sides with bristles which mean when a baby bites down, not only are the top of the gums being cleaned, but the back and front too. Silicone offers a soft biting surface on which the child can chew as they deal with the pain associated with teething. A handle on the teether allows the child to easily grip it, but it is large enough that the teether itself will not become a choking hazard. You can attach a pacifier/dummy clip onto it if you like too. Dishwasher safe, it can be easily sterilised. 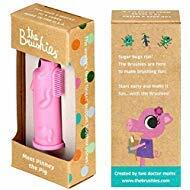 I would not suggest you use this as your only toothbrush, particularly with older babies and children, but it is a great tool for easing them into brushing and allowing them to safely ease discomfort when teething. View the official Brush Baby product page. The 3rd Brush-Baby product to feature in this list, it says something about the company and the products they offer. Although suitable for children up to the age of about 16 months, parents will likely get best value from these with newborns and younger babies who have yet to develop too many teeth. With endorsements from the likes of the Singing Dentist (Milad Shadrooh), these wipes are sterile and hygienic for your little one. Fluoride and paraben free, a simple wipe across the gums, tongue and cheeks can help keep the mouth of your baby clean and free of unnecessary bacteria. The wipes themselves are not all that cheap and for most parents, you can potentially cut the wipe in half to get extra value from it as 1 wipe is probably a little larger than you need. Only issue here is not letting it dry out until you need to use it. They are a nice option if tooth brushing is not working right away and you prefer an alternative option to a damp washcloth. 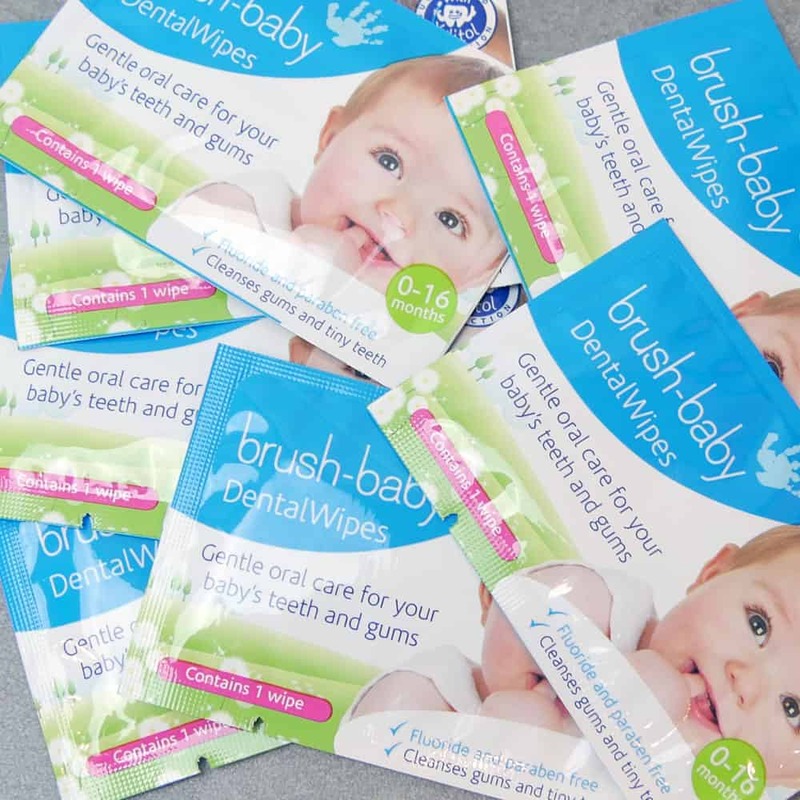 View the official page for the Brush-Baby dental wipes. Whether you go by my recommendations or not, I have included the following buyers guide, to help give you extra insight into what you should be looking for and considering when buying a toothbrush for a baby and toddlers. Is your child a newborn/baby/toddler? Many parents consider their children to be their ‘babies’ even if they are grown up and have moved out of the family home! However, when it comes to looking after their teeth, there is a need to use different products and adapt techniques slightly based on the age of the child. As every child develops at different rates, their tooth development and the approach needed will not be the same for every parent and child. Use these age ranges as a guide to how you approach looking after the teeth of your children. Eruption is the technically correct word to describe the appearance of a new tooth in the mouth of your child. You might call or know this better as ‘breaking through’ or ‘coming in’. As a parent you will know there are certain milestones for children to hit and each child will develop at slightly different paces, but the following is a fairly accurate guide of when you can expect your baby’s teeth to erupt. 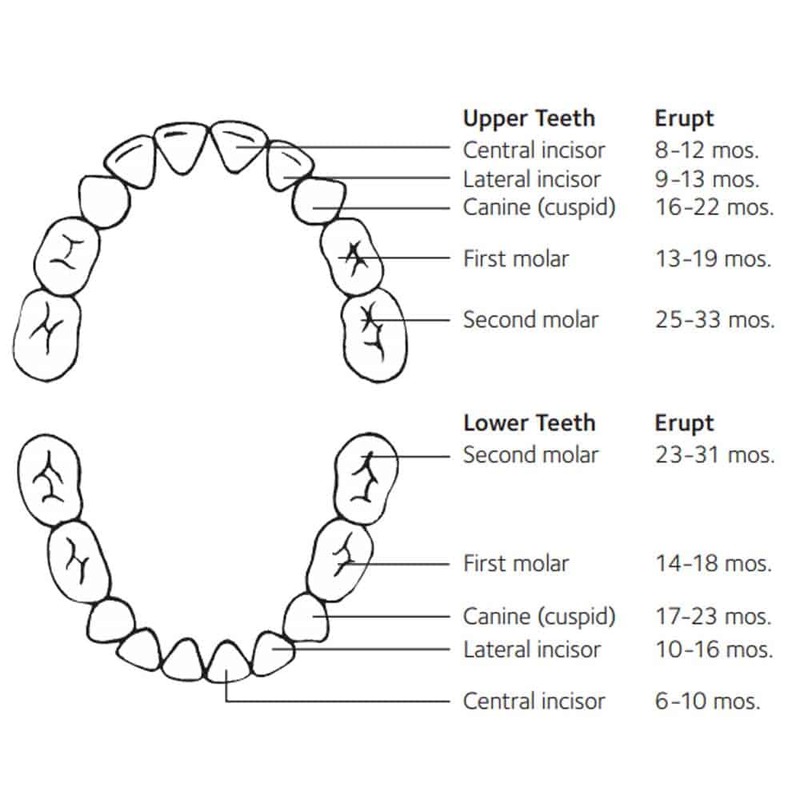 The majority of teeth in a baby/toddler erupt by the time they are 2 years old, but the last teeth can take up to the child’s 3rd birthday to erupt. There can be variation in what time the tooth comes through. It may be up to 6 months either way. Try not to worry too much if your baby doesn’t follow the chart above exactly. Teeth don’t usually erupt over night. It is a slow process and you can usually see the tooth emerging from under the gum as the tissue thins and the white enamel of the tooth becomes clearer. This is rarely a pain free experience for the child and ‘teething’ is the term used to describe the period of suffering as the tooth comes through. If your baby is drooling, has swollen gums and a higher than normal temperature these are all signs of teething. It can be days or even weeks before the tooth finally erupts and it is perfectly normal for the baby to feel uncomfortable and generally a bit sorry for themselves during this time. Whilst I can’t compare first hand, it is likely equivalent to you having toothache or a dull headache. Some adults may get a similar pain when their wisdom teeth come through! You can function, but you certainly don’t feel at your best. There are lots of tips available online and from health workers on approaches you can take to help ease the child’s discomfort, but teethers/chewable toothbrushes can be a great option. You may not have even considered that there are different types of toothbrushes available, but there are. The different types serve different purposes. Firstly, some are geared to the youngest of children with no or very few teeth, whilst others are better suited for those toddlers with the majority or all of their teeth. Different designs and styles also allows for you as the parent to find the brush that works for you and your child as not all children will necessarily like the same thing. 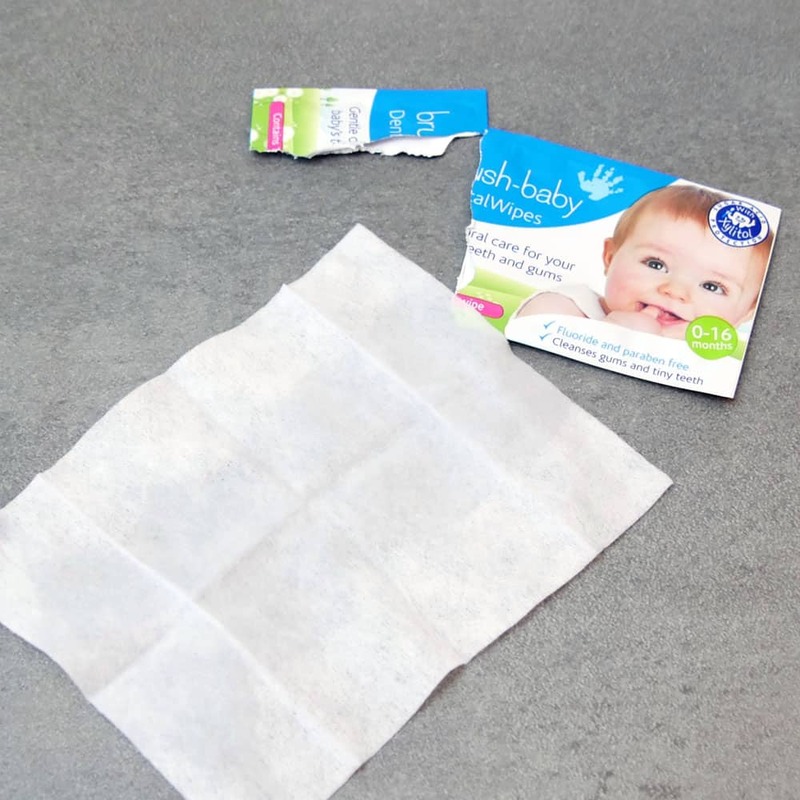 Essentially a small wet wipe, designed to be passed over the gums, cheeks and tongue of your little one. The wipe should be wrapped over your index finger and carefully placed and moved over the surfaces to cleanse them. Most suitable for newborns and babies, 0-12 months. You can continue to use beyond 12 months up until approximately 18 months, but as teeth come through other brushing options should be used in conjunction as these are not suitable as the only option once teeth have begun erupting. 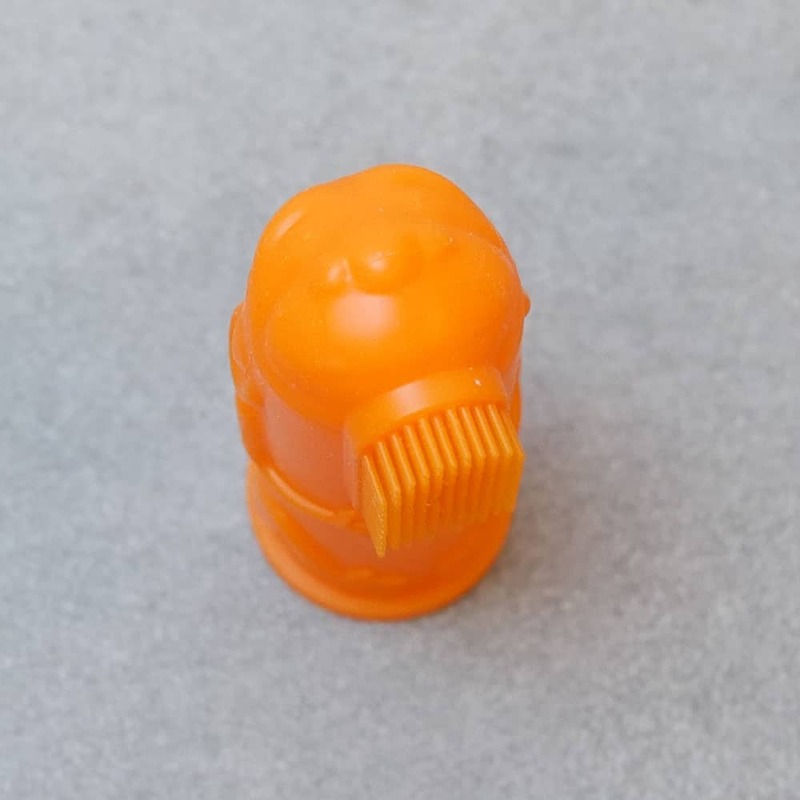 Often designed as a thimble that fits over the parents finger, like the wipes, the brush should be moved in and around the mouth of the child to clean the exposed surfaces. There are typically a number of silicone bristles on the end of the brush that gently sweep across the gums and soft tissue in the mouth. Toothpaste is not generally needed as the wiping action in conjunction with the child’s saliva will be sufficient. Most suitable for newborns and babies, as a number of teeth come through you will likely want to move to a different option around 12 months/1 year. 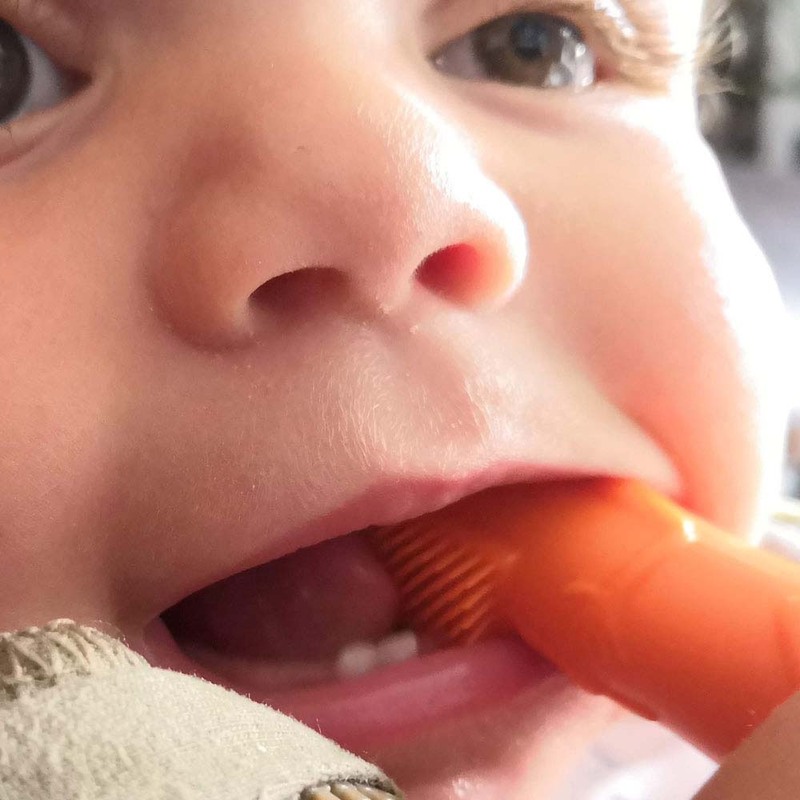 There are many teethers on the market, but chewable teethers that act as a toothbrush can be beneficial to you and your child. Unlike most teethers, teether toothbrushes normally are more flexible and shaped in such a way that they hug the gumline. Short silicone bristles make contact with the gum tissue and as the baby bites on the teether. Not only does the soft material help ease discomfort, the bristles dislodge bacteria and get your precious one more familiar with the sensation of bristles touching and wiping along the gums. Generally speaking these are suitable for babies that are 6 months of age right through to toddlers, although greatest benefit is likely to be between 6 and 18 months. 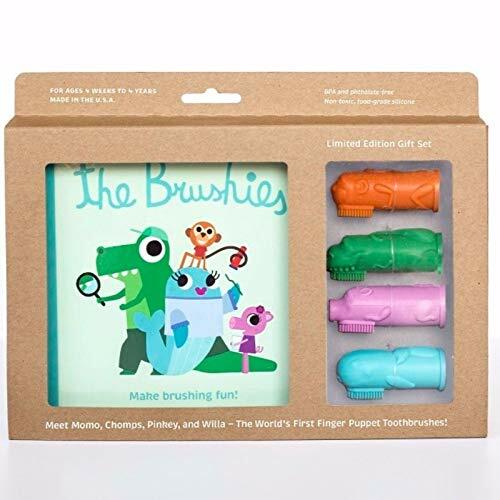 A good option to use in addition to another tooth brushing product, these are great for child led teething/brushing as opposed to you as a parent having to watch over the whole time. Toothpaste is not always necessary, but can be applied to help achieve the clean teeth if regular brushing with toothpaste is proving more problematic. The good old manual brush, only smaller with super soft bristles. Relying on you as the parent to move the brush over the teeth and gums, the bristles will dislodge and sweep away food debris and bacteria as they make contact with the teeth and gums. 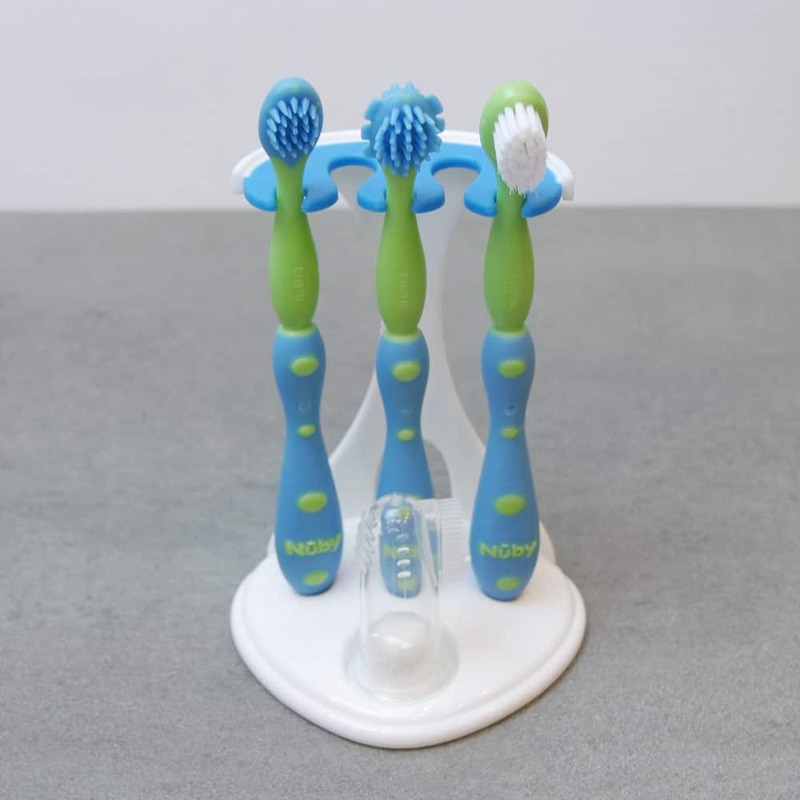 Available in a couple of different sizes you have what many class as the ‘baby toothbrush’ which tends to suit those children aged 6-18 months, whilst a ‘toddler toothbrush’ is suitable from about 12 months right through to 36 months, or 3 years old. The brush handles tend to be brightly coloured and soft to the touch to make for a more engaging experience for the child. 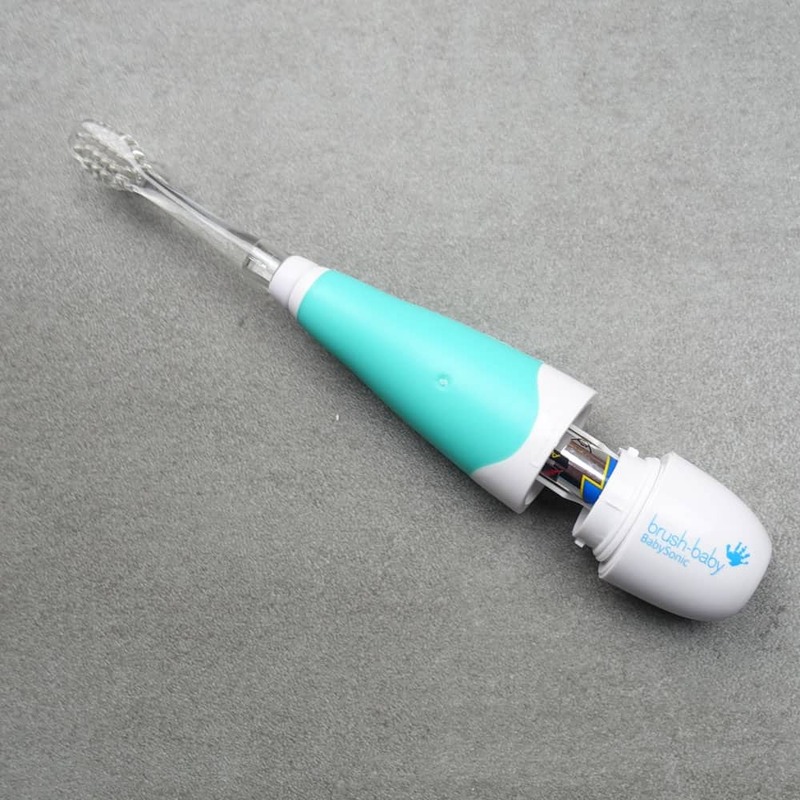 As the name implies this is an electrically powered toothbrush. Much like the electric brush you may own just on a smaller scale and not as powerful. Doing a lot of the work for you, these brushes are normally powered by an AAA or AA battery as opposed to a built in rechargeable battery. 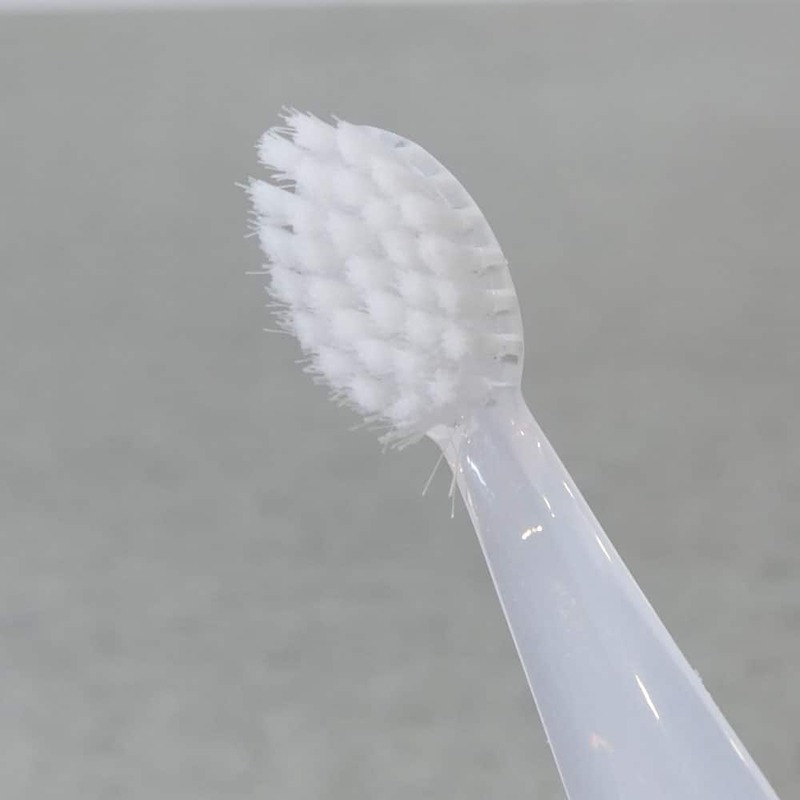 Vibrations are passed via a motor to the brush head so that the bristles move rapidly over the teeth and gums, you just control the position of the brush head. The additional movement provided can be an extra help to achieve a more thorough clean. Brush heads tend to come in different sizes to suit the different aged children. The smallest brush heads tend to suit 6-18 months with larger sized heads for toddlers 18-36 months old. The bristles are very soft so as not to damage the teeth and gums. Toothpaste should be used when brushing. Some of the better electric brushes will have timers built in too, to being the educational process about the correct brushing time of 2 minutes. There are tens if not hundreds of differently designed toothbrushes available today. Many claim that they could be the toothbrush for your child. Truthfully, it is a period of trial and error in finding the one that works for you and your baby, but amongst all of the options available there are some key things you should look for. The teeth and tissues within the mouth of a baby are much more delicate and susceptible to damage than that of an adult. The bristles fitted to a brush head for a baby should be very soft, softer than the soft/sensitive bristles you find on an adult toothbrush. Bristles may be made of silicone/plastic or traditional nylon type fibres. 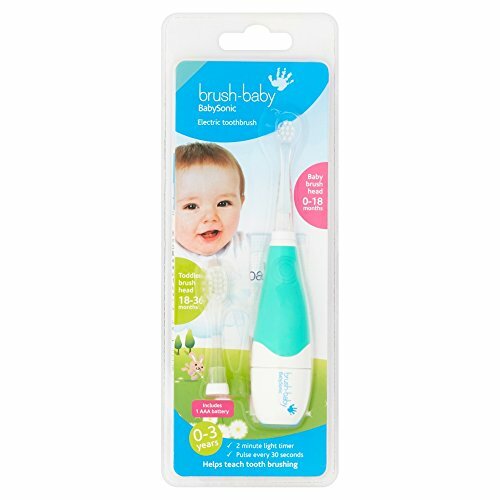 The small head allows for the brush to fit comfortably into the baby’s mouth. It makes for easier manoeuvrability around the teeth and gums. Makes it easier to grip onto, particularly when the baby begins the process of holding and brushing for themselves and may use 2 hands. There are also a few additional features that can make a baby toothbrush better suited, but are not necessarily deal breakers. The use of bright colours and bold designs captures the attention of the child and distracts them from any concern they might have about the experience and helps engage them as they are drawn to the brush. If the brush has or makes use of characters from books or TV shows they like, this can help to. Soft rubberised materials that make the brush easier to hold and less slippery when in hand is beneficial to parent and baby alike as brushing can get messy and wet. Carefully thought out shaping to the brush handle with contours for added contact helps keep a firm grip on the brush too. A rinse under the tap can wash away residual bacteria and grime, but those that are dishwasher safe can ensure higher levels of hygiene for your baby. When should I start brushing? You might not think it necessary to worry about cleaning the gums before a tooth erupts, but you really should begin within days of welcoming your newborn into the world. I know first hand how at this stage, just getting some sleep will feel like a bigger priority, but wiping those gums will be worth it. Your aim at this stage is to get your little one used to having things put in their mouth, ready to introduce brushing later. At this stage it is not a case of whipping out a tube of toothpaste and electric toothbrush, but a much more gentle act of wiping the gums, cheeks and tongue. Use a damp washcloth or piece of gauze, twice a day, particularly before bed. The sooner the newborn experiences this sensation, the quicker they should get used to it and all being well the easier it will become as teeth develop. Milk, even the natural breast milk leaves behind a residue that is not always ideal for your child’s oral health. With the introduction of other foodstuffs as the baby is weaned, the risk of decay increases with plaque able to build up thanks to more bacteria and more sugars on which it feeds. Making brushing a daily habit helps deter cavities and unwanted dental health problems. You should brush your child’s teeth twice a day. Ideally, this will be just before bed and another time in the day. Considering that not all children will cooperate it can be helpful in the early weeks and months of brushing to try it more regularly throughout the day, maybe 3 or 4 times for shorter periods, to build up familiarity and enjoyment around brushing. For a baby and toddler, you should use a fluoride based toothpaste that contains no more than 1000 parts per million (ppm) (NHS). Most adult toothpastes contain a higher level of fluoride. It is important not to swallow too much toothpaste as it can have long lasting effects. It does not matter what brand of toothpaste you use providing it has the right level of fluoride in it. There are many ‘kids’ toothpastes, but these are not necessarily essential, providing the chosen paste has the right amount of fluoride in it. Many of these pastes specifically designed for kids come at a cost premium. Ideally, you want to use toothpaste from as soon as the child’s first tooth erupts, to help fight any possible decay. However, some form of brushing, even without toothpaste is better than nothing in the early stages, but do your best to introduce it as soon as possible. How much toothpaste do I need? You may have heard the phrase, a ‘pea sized amount of toothpaste’, but this applies to adults and children aged 3 or above. Babies and toddlers require much less. You only need a smear or an amount equivalent to a grain of rice. Some toothbrushes will have coloured bristles that act as an indicator as to just how much toothpaste you need. Most parents will tell you that mastering the art of brushing your children’s teeth is not easy. A baby might well be a little more docile and easier to control that a toddler going through the ‘terrible twos’, but each bring their own challenges. It will take time and patience on your part to find the right products, the right approach and routine that works for you and your little ones. It is highly likely that you will have to try different types of toothbrushes until you find one that both you and the child agree on. Some will not like the shape, sensation and overall experience, whilst others will take to it more naturally. Keep in mind, this is a new experience and not normal and may respond negatively. Starting early can help. Having them with you when you brush can also set a good example. The more interactive, fun and engaging you can make the teeth brushing, the better the chances of success. Maybe play some entertaining music as they brush, or play a game. Interactivity and reward tends to work really well, particularly for older children as we have seen with those electric toothbrushes for kids. Whilst oral care is important and should become part of their daily routine, it is too important to allow time to get them used to the whole experience and not put off. If it is not working, take a break, come back again in a couple of hours. How often should I replace the toothbrush? Every 3 months is the recommended time frame. However, you need to replace it sooner if our baby has a tendency to bite down on the toothbrush and the bristles are splayed, frayed or in generally poor shape in comparison to when it was new. Silicone bristle brushes tend to be more resilient and can look as good as new after 3 months of use, but for hygiene reasons, it is advisable to replace it. It is incredibly important that your baby sees a dentist early on in their childhood. In the UK a recent campaign by the British Society of Paediatric Dentistry advises that your child has their first dental check by 1 year old. Make sure that you have taken them to see a dentist by the time they turn 1 years old. A visit to the dentist should not happen only when there is a problem, but regularly to stop any problems occurring in the first place. Whilst a baby/toddler will eventually lose their first set of teeth, the care of their first set has a knock on effect to the development and health of their permanent teeth. Dentists want children to have healthy teeth and a big smile and by taking your little one for regular checkups you can ensure they do. An early visit allows the child to get familiar with a new person, the odd surroundings, sounds and smells. A morning appointment tends to be good, when the child is well rested, but awake and alert. During the visit, the dentist should help the child feel at ease and inspect their mouth for any sign of problems including injury and cavities caused by decay. The key to brushing your baby’s teeth is you and your approach. Brushing needs to be a positive and fun experience, that develops over time until they get it themselves. Most of the brushing in the early years will be done by you as the parent, only at the age of 6-8 years old, might the child be able to competently brush their own teeth. Even then, they may miss some key areas. For newborns, wiping the gums and tissues of the mouth with a damp washcloth or using a dental wipe is perfectly fine, whilst they lay cradled in your arms. With babies, it will be a bit of trial and error particularly as the teeth start erupting. You will likely want to start with a finger toothbrush and move onto a manual brush. There is no absolute right way in the early stage of tooth brushing for babies. General advice is to site the child upright, on your knee, with their head resting against your chest. For toddlers, you can have them sit or they can stand with a very slight tilt of their head backwards. You want to make contact with all the tooth surfaces, and the gums along with the cheek and tongue. Don’t brush just the front teeth. Move the brush in small circles, covering all surfaces if possible. Don’t be too worried about spending 30 seconds on each quadrant of the mouth as is the normal approach for older children and adults. At this stage it is about taking the approach which allows you to get the best result for your child. With a fun and entertaining attitude towards brushing, the child should naturally take the brush and have a go themselves, getting comfortable with having it in their mouth. You are using just a tiny amount of toothpaste at this stage, encourage them to spit any remaining paste out rather than swallowing it. Key things to avoid are forcing the brushing session, it needs to be natural as the child will resist otherwise. Do avoid rinsing the mouth out after brushing as this will wash away the goodness left behind by the toothpaste. Also, do not lay the child flat to brush their teeth, this brings in the gag reflex and can put children off. Children should continue to be supervised for tooth brushing until the ages of seven (think about when they are able to tie their own shoe laces). The cost of toothbrushes for babies and toddlers are typically a little bit higher than the price you might pay for an adult toothbrush. The reason for this is because of volume and demand. 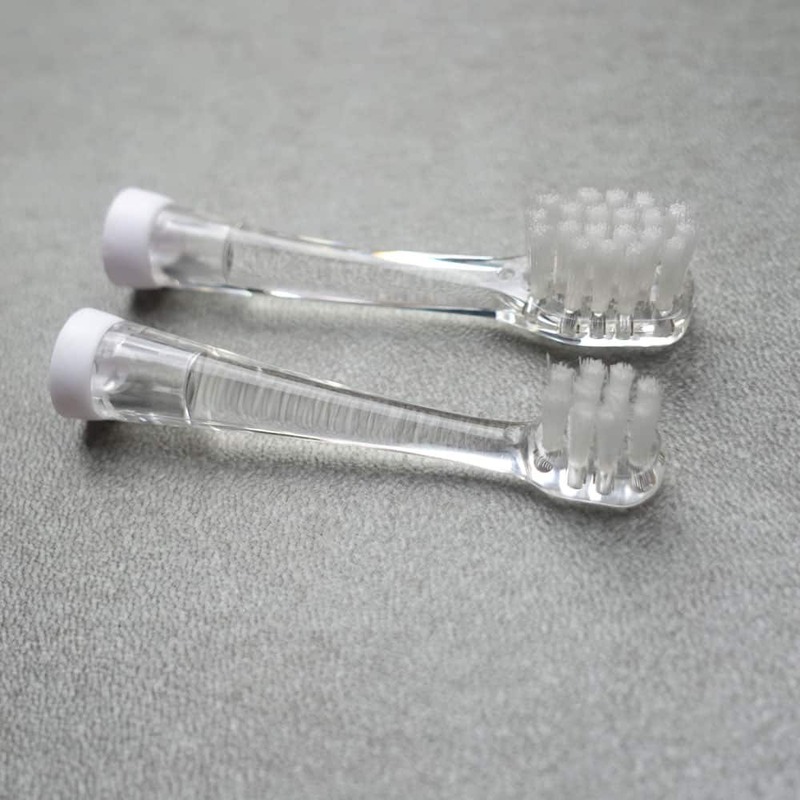 Regular adult brushes can be produced and sold more cost effectively because there is a greater number of the public buying them than they are baby toothbrushes with very soft bristles. Brushes for babies and toddlers tend to require more materials because although smaller, they are odd shaped, with fatter handles and gripping points along with more colours in the mix too. Many have silicone as a key material which is more expensive to produce than plastic and nylon that is found on a regular adult brush. Most brushes tend to be around £4-6 in cost and will need replacing every 3 months. It might be another expense that you would rather avoid, but investing in a good brush will in the long term pay off and prevent costly and potentially painful dental issues in the future. There isn’t necessarily a best place to buy a toothbrush for your baby from. Amazon do stock the biggest range in our experience, but any good pharmacy or supermarket will have a good range of options. Got some feedback or suggestions of other baby toothbrushes?